8 December 2010, at 10:09a.m. DOMINICAN REPUBLIC - Orego-Stim® was recently launched in the Dominican Republic. 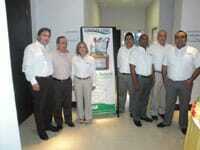 From left to right: Javier Sicard: Executive Director-CEO, Alfonso Díaz: Comervet speaker, Constance Mojica: Managing Director, Ricardo Monsalve: Technical Sales Representative Poultry Line, Ariel Guzmán: Area Technical Manager Poultry, Eduardo Cabrera: Technical Representative Poultry Business Line, Carlos Andres Monsalve: Administrative Manager. Orego-Stim® is the 100 per cent natural feed additive/flavour used globally in the diets of a variety of commercial livestock species to enhance and maximise overall performance, increasing financial returns. 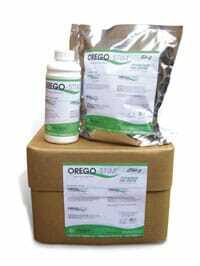 Orego-Stim® not only improves the functioning of the gut, but is renowned for other interesting properties. Around 100 people from the agribusiness sector attended a seminar at which the main speaker on Orego-Stim was Dr Alfonso Diaz from Colombia. The seminar was organised by the Meriden Animal Health Ltd distributor Simtec S.A. and Javier Sicard, CEO, commented: "The seminar has been a huge success and we look forward to working with Meriden Animal Health Limited in developing this exciting market."